A US Airways pilot redirected his plane last month because the crew didn’t recognize the two black boxes a passenger was wrapping around his head and arm. The young passenger was fulfilling the Jewish ritual of tefillin. Unaware of the significance of the holy objects, the crew reacted with suspicion. A recent e-mail sent around to Jewish men’s clubs after the incident showed an image of a young man wearing tefillin superimposed over an airplane and asked how readers would respond if they had to explain the ritual to the flight crew. “It’s one of those traditions that looks weird and feels strange, and so there’s a fairly high barrier to overcome to get people to experience it,” said Rabbi Randall Mark of Cong. Shomrei Torah in Wayne. Thousands of men around the world will experience the mitzvah of tefillin on Sunday when the Federation of Jewish Men’s Clubs holds the 10th annual World Wide Wrap. More than 175 men’s clubs, representing thousands of people, are signed up for the event. Mark, who is the spiritual adviser to the FJMC’s Northern New Jersey region, said the event gives men the opportunity to perform the mitzvah together and not feel out of place. He likened the experience to seeing a football player in full uniform. Such a sight would be normal in a football stadium, he said, but appear strange in a setting like a supermarket. 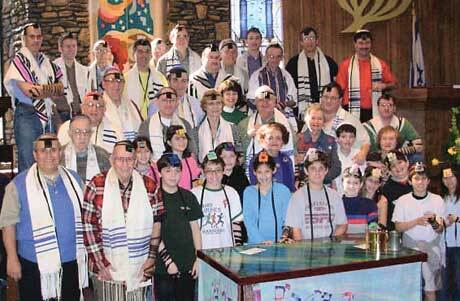 The Wrap encourages learning about tefillin within the synagogue environment, he said. “The men’s club understands that often men will do things collectively they may not be inclined to do individually,” he said. At Temple Israel and Jewish Community Center in Ridgewood, the seventh-grade Sunday school class will participate in the Wrap with the Sunday morning minyan. Tefillin are traditionally worn by men, but men and women will be invited to participate. In addition to putting on tefillin, students will peek inside a “non-kosher” set that has been opened up. To help educate children, Ira Ungar, chair of the FJMC’s tri-state region in Pittsburgh and one of the Wrap’s co-chairs, created the build-a-pair program, which distributes kits for children to make and decorate their own (non-kosher) tefillin. The sets make kids comfortable with tefillin, Weis said. “They have fun doing it,” Ungar said. While the Orthodox world has maintained the mitzvah, the non-Orthodox world has forgotten about it, Weis said. He credited Rabbi Charles Simon, executive director of the FJMC, for bringing tefillin back into Conservative practice. The US airways incident became “a teachable moment,” Mark said and gave a boost to FJMC’s efforts to raise the profile of tefillin. “It raises the whole issue that Jews at a minimum should know what tefillin are and everybody else should have some idea,” said David Millman, of the Brandeis Men’s Club at Temple Israel and Jewish Community Center in Ridgewood. Millman is also the correspondence secretary for the Northern New Jersey region of the FJMC. Ungar created the e-mail challenging some 7,000 men’s club members on how they would react if they saw someone putting on tefillin on a plane. “The idea is to educate Jewish men as to the significance of putting on tefillin and hopefully if ever faced with a similar situation, they’ll know what to do,” he said. For more information and a list of participating men’s clubs, visit www.worldwidewrap.org.